*Centre for Economic Studies and Planning (CESP), Jawaharlal Nehru University, New Delhi, praveenjha2005@gmail.com. †CESP and Centre for Budget and Governance Accountability (CBGA), New Delhi. Abstract: The decline in the rate of growth of Indian agriculture in recent years is in large measure due to the low public expenditure priorities accorded to it in the budgets of the Union and State governments. Since the early 1990s in particular, inadequacy of capital formation has been a major factor contributing to the slackened pace of technological change and infrastructural development in Indian agriculture, with adverse consequences for agricultural productivity and output. Our attempt in this article is to look at the trends and patterns of public expenditure, and the priority accorded to India’s rural economy, in different budgets over the years. The core issues we examine here are: trends in the level of public expenditure on the rural economy since the 1950s; the composition and priority of such expenditure under major heads; and a comparative analysis of public expenditure across States since the early 1990s. Keywords: agricultural finance, political economy, infrastructures, other public investment and capital stock and budget, budget systems. The stress experienced by Indian agriculture in recent years and the decline in its rate of growth are in large measure due to the low public expenditure priorities accorded to it in the budgets of the Union and State governments.1 Since the early 1990s in particular, inadequate capital formation has been a major factor contributing to the slackened pace of technological change and infrastructural development in Indian agriculture, with adverse consequences for agricultural productivity and output. In 1980–81, the share of capital formation in agriculture in gross fixed capital formation of the country was 15.05 per cent, which declined to 10.04 per cent in 1990–91 and further to 6.91 per cent in 2000–01. Similarly, public sector capital expenditure on agricultural development in many States of India witnessed varying degrees of decline. a comparative analysis of public expenditure across the States since the early 1990s. First, we provide an overview of the data sources and the methodology we have used in this article. In our analysis, the broad sector defined as “Rural Economy”2 (henceforth RE) goes beyond the combined “Agricultural and Allied Activities” and “Rural Development” sectors as defined in the accounting classification conventionally maintained in the budgets of the Union and State governments. We take into account the combined budgetary allocations made towards RE by the Union and State governments, which include expenditure under the following heads: agriculture and allied activities,3 rural development,4 fertilizer subsidy,5 irrigation,6 and cooperation,7 and then compile the relevant data on expenditure (under both revenue and capital accounts) since 1950–51. As is well known, comparative analysis of data on budgetary allocations to the “Rural Economy” thus defined is difficult, mainly because of changes in the functional and accounting classifications in budgets of the Union and State governments over the years. While processing data under various heads of expenditure we have followed the functional classification of expenditures in the relevant documents, as such classification permits a better way to examine inter-temporal trends in government outlays on a particular function.8 However, it should be noted that there have been significant changes even in the organisation of the functional classification from 1950–51 to 2009–10. For instance, the current format of expenditure classification under economic services9 is available only after 1973–74, and data prior to this year are available only under two broad heads of expenditure, namely, developmental10 and non-developmental expenditure.11 Further, in April 1987, a new format of accounting classification prescribed by the Comptroller and Auditor General (CAG)12 of India was introduced, which resulted in clubbing together some existing heads and introducing new heads within the functional classification of budgets. We have tried to take these changes into account while collating the relevant functional heads to compute the quantum of public expenditure under RE. As regards expenditure data on RE of State governments, we have taken into account all the above-mentioned functional heads except fertilizer subsidy. The reason for this exception is that a large part of the burden of fertilizer subsidy is borne by the Union government (and is hence a part of the Union budget), and State governments make hardly any provision under this head. Accordingly, we have examined the status of and trends in budgetary expenditure on RE by State governments since the early 1990s.13 Another point that needs to be noted here is that while examining the relevant trends, we have not disaggregated them under heads such as “revenue,” “capital,” “plan,” and “non-plan,” basically to ensure that our discussion does not become too cumbersome. Rather, we have taken the combined budgetary expenditure figures, i.e., revenue plus capital in the case of Union14 and State governments together, and revenue, capital, and loans and advances under RE for the States. The data used in this article have been taken primarily from different publications of the Ministry of Finance (MoF), Government of India, and the Reserve Bank of India (RBI). For information on combined budgetary expenditure on RE, we have used various issues of Indian Economic Statistics, Public Finance (earlier version of Indian Public Finance Statistics), and Indian Public Finance Statistics (IPFS), a report annually published by the Ministry of Finance, Government of India. As regards the relevant data for State governments, the RBI’s Handbook of Statistics on State Government Finances, 2010 and State Finances: A Study of Budgets have been used extensively. Wherever required, we have also drawn on information provided in the annual Economic Survey of the Government of India. Agriculture and rural development have been important components of India’s overall planning framework right from Independence, although the public policies and expenditure patterns relating to these sectors have undergone significant changes over the years. Depending on the particular analytical lens one wishes to use, the entire post-Independence period may be classified into alternative typologies of different phases. We shall not go into details of the existing and potential methods of categorisation, but shall use a three-phase classification of public expenditure policies for agricultural and rural development. However, despite all the talk about prioritising agriculture during this period, there were serious lacunae and policy failures in both institutional and technical respects. Consequently, in spite of a significant increase in its growth rate as compared to the period of British colonial rule, the agricultural sector performed well below its potential in the first two decades after Independence. In fact, the mid- to late 1960s were a period of a veritable agrarian crisis, partly due to major monsoon setbacks for two consecutive years in the mid-1960s and also due to systemic policy failures since the early 1950s. The third phase (from the early 1990s till the present) reflects the ascendance and dominance of neoliberal economic policy. Close observers of the Indian economy take it as an incontrovertible conclusion that for much of this period, the country has witnessed a serious agrarian crisis – the worst, in fact, since Independence. The most gruesome manifestation of the crisis has been farmers’ suicides (which started appearing as headlines in the mainstream media in the late 1990s, but now gets only passing mention). The extreme step to which large numbers of Indian peasants have been driven has been reported from several regions of the country, including even prosperous States like Punjab, Kerala, and Maharashtra.17 Factors such as the substantial reduction of rural development expenditure, increased input prices, vulnerability to price fluctuations in the world market due to greater openness, inadequate (or non-existent) crop insurance, and substantial weakening of the rural credit system (especially credit to small and marginal farmers, who constitute more than 80 per cent of the total farming community), along with governmental apathy towards farmers’ demands for remunerative prices for their produce, are among the obvious causes of the present agrarian crisis. In respect of the focal concern of this paper, a point worth emphasising here is the relative stagnation in overall public expenditure on RE during this phase. There has been a noticeable decline in rural development expenditure18 in the period of economic reform (i.e. since the early 1990s) as compared to the pre-reform period, as has been noted in several studies (see, among others, Patnaik 2003 and 2006, Jha 2007 and 2009, Golait et al. 2008, Chand 2010, Mahendra Dev and Sharma 2010). In what follows, we take a close look at the budgetary trends in RE since the 1950s. We begin with the combined budgetary expenditure of the Union and States on this sector. The relevant data show that the shares of budgetary expenditure on RE in total combined budgetary expenditure were 11.4 and 12.0 per cent, respectively, in 1950–51 and 1960–61. There was then a noticeable dip in the mid- to late 1960s (9.9 per cent, annual average for 1966 to 1969), before this share rose during the 1970s and 1980s. 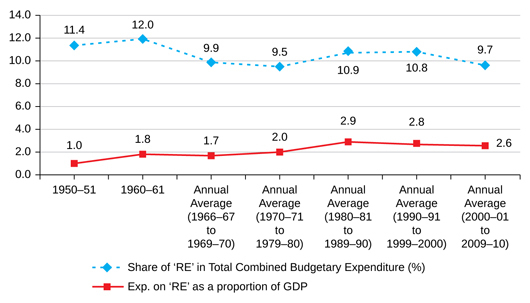 From the mid-1970s, the share of budgetary expenditure on RE moved upward, to reach 10.9 per cent in the 1980s (annual average for 1980–81 to 1989–90). Thereafter it declined continuously, until it reached 9.7 per cent in the last decade (annual average for 2000–01 to 2009–10) (Table 1). 1. This is the consolidated budgetary operations of the Central, State, and Union Territory governments. Inter-governmental transfers like grants and loans to sub-national governments have been eliminated from the consolidation. 2. Total combined budgetary expenditure is equal to total non-developmental expenditure + total developmental expenditure + net loan; and items like self-balancing and transfer to funds have been deducted. Data for the years 2008–09 and 2009–10 are revised estimates and budget estimates, respectively. 3. The budgets of the Central, State and Union Territory governments for the years 1974–75 and 1975–76 have been presented on the basis of revised classification of transactions. In view of this, it has not been possible to ensure correspondence of earlier revenue expenditure items with the items appearing in the new budgetary classification for the years 1972–73 and 1973–74. While every care has been taken to bring about comparability between old and new classifications, a certain amount of approximation has become inevitable where true correspondence between them could not be established for want of adequate details. 4. From 2000–01, the figures under the head Crop Husbandry (within Agriculture and Allied Activities) are taken from IPFS, 2009–10, so these figures may not be equal to those given in earlier years of IPFS. 5. GDP figures at market prices and current prices, at base 2004–05, are taken from the base data given in the Economic Survey, 2010–11, Government of India. Source: Computed by authors from the base data given in Indian Economic Statistics, Public Finance, and Indian Public Finance Statistics (IPFS), Department of Economic Affairs, Economic Division, Ministry of Finance, Government of India. Similarly, the share of RE in the country’s GDP showed an increasing trend during the 1950s and early 1960s, stagnated during the mid-1960s and 1970s, and then increased again during the late 1970s and 1980s. As may be seen from the relevant tables and figures in the annexure, the share of RE in the country’s GDP reached an all-time high (2.9 per cent) in the 1980s (annual average for 1980–81 to 1989–90) before exhibiting a declining trend from the early 1990s. In the last decade (annual average for 2000–01 to 2009–10), the corresponding ratio was distinctly lower than during the 1980s (Figure 1). Further, while examining the priorities of public expenditure under various major heads within RE since 1950–51, it clearly emerged that three components, namely, agriculture and allied activities, rural development, and irrigation and flood control, received a major part of the allocations during the entire period of examination. Source: Compiled by authors from the base data given in Table 1. The share of combined (both Union and States) expenditure on agriculture and allied activities in total combined expenditure on RE was only 4.1 per cent in 1950–51, and this increased to 25.9 per cent in the 1990s (annual average for 1990–91 to 1999–2000). However, during the next decade, this share came down to 17.1 per cent (annual average for the period 2000–01 to 2009–10, Table 2). As regards the share of budgetary expenditure on rural development programmes in total budgetary spending on RE since the 1950s, the trend was an increasing one: it was 23.6 per cent in 1950–51 and increased to 48 per cent in the 2000s (annual average for 2000–01 to 2009–10). For a decade from the late 1960s, the trend for this component was stagnant (Table 2). In respect of irrigation and flood control, as mentioned earlier, substantial attention was paid to irrigation and flood control and a major chunk of resources directed towards the sector in the early decades after Independence. The share of expenditure on irrigation and flood control in total budgetary spending on RE in 1950–51 was 68.5 per cent. However, in subsequent decades, particularly after the mid-1970s, that share declined sharply. As may be seen from the relevant data, during the 2000s, it went down to as low as 5.5 per cent (annual average for 2000–01 to 2009–10, Table 2). Although a clear division of responsibilities between Union and State governments is envisaged in the Constitution of India, and subjects like overall development and maintenance of irrigation projects are largely the responsibility of State governments, their neglect in the Union government’s budget over the years is a matter of serious concern. We now move to an examination of the trends relating to the share of public sector plan expenditure on RE in total public sector plan expenditure of the country. Here, we find a pattern similar to the trends in combined budgetary expenditure over the years. The share of public sector plan expenditure on RE was 23.3 per cent during the period of the Third Five-Year Plan, and it increased to 25.7 per cent in the Sixth Five-Year Plan. The point worth noting is that between the late 1960s and mid-1980s, almost a quarter of the total public sector plan expenditure was allocated to RE. In the succeeding Five-Year Plans, however, that share was consistently lower than during the Sixth Five-Year Plan; the ratios were 23.5 per cent, 23.7 per cent, 21.6 per cent, and 20.1 per cent, respectively, during the Seventh, Eighth, Ninth, and Tenth Five-Year Plans. In the Eleventh Five Year Plan period, the share dipped further to an all-time low of 18.5 per cent (Table 3 and Figure 2). As noted earlier, for two decades from the early 1970s there was significant prioritisation of plan expenditure towards this sector in order to pull it out of the near-crisis situation witnessed in the 1960s. Source: Compiled by authors from the base data given in the Economic Survey, 2010–11, Government of India, Statistical Appendix, A 40–46. Source: Compiled by authors from the base data given in Table 2. On examining plan expenditure on different components of RE, it emerges that agriculture and allied activities was an area of concern for a much longer period, and one may argue that it did not receive adequate attention even in the pre-reforms period.19 After an initial spurt in its share during the first two decades after Independence, there was a deceleration, particularly from the late 1970s. 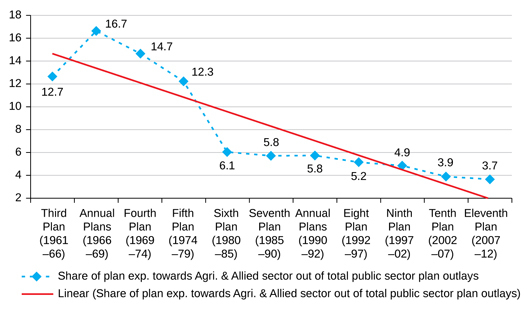 The share of agriculture and allied activities was 16.7 and 14.7 per cent during the 1966–67 and 1968–69 Annual Plans (average for 1966–69) and Fourth Five-Year Plan (1969–74) respectively, and that share declined to 3.9 per cent in the Tenth Five-Year Plan (2002–07) and, further, to as low as 3.7 per cent in the Eleventh Five-Year Plan (2007–12) (Figure 3). Significant allocations were made towards irrigation and flood control during the early decades after Independence, and much of this was under “plan” heads. 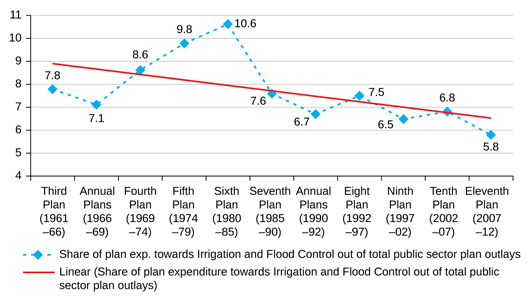 A rising trend in the share of irrigation and flood control continued up to the Sixth Five-Year Plan (1980–85), but there was a subsequent reversal. 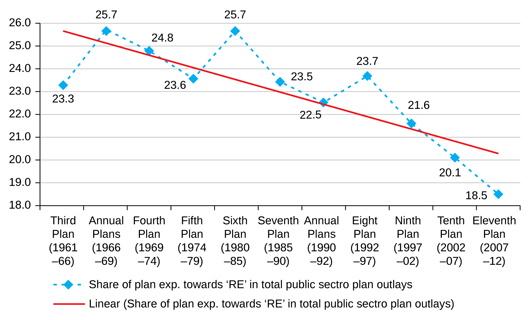 As may be seen from Table 3, by the end of the Eighth Five-Year Plan (1992–97) the share of this component had come down to 7.5 per cent, as compared to 10 per cent during the Sixth Five-Year Plan (Figure 4). The share of expenditure on rural development in total public sector plan expenditure on RE increased from 7 to 8.3 per cent between the Seventh Five-Year Plan (1985–90) and Eleventh Five-Year Plan (2007–12).20 On the other hand, the share of plan expenditure on village and small industries in total plan expenditure has shown a marked decline in recent years; it came down from about 2 per cent during the Sixth Five-Year Plan (1980–85) to about 0.7 per cent during the Eleventh Five-Year Plan (2007–12) (Table 3). In terms of the functional distribution of responsibilities between the Union and State governments, agriculture falls under the purview of State governments. However, given the importance of this sector in the economy, the Union government provides budgetary support in the form of grants-in-aid to the States from time to time. Besides providing such grants, the Union government also makes direct or indirect interventions in this sector, within and outside State budgets. In what follows, we state some of the important features of budgeting for RE by State governments. As mentioned earlier, we have restricted our analysis of State budgets for RE to the period from the early 1990s because disaggregated data across States for the period prior to the 1990s are not available. The trend for all States taken together is a declining one, similar to the case of combined budgetary expenditure. The share of RE in the combined total budgets of all States was 21.9 per cent in 1990–91; it declined to 19.4 per cent during the 1990s (annual average for 1991–92 to 1999–2000) and further to 14.9 per cent during the 2000s (annual average for 2000–01 to 2009–10) (Table 4). In other words, relative provisioning for RE declined substantially, by 47.3 per cent, between 1990–91 and 2009–10 (Table 5). Notes: Data for 2008–09 and 2009–10 are revised estimates and budget estimates, respectively. Source: Compiled by authors from data provided in the Handbook of Statistics on State Government Finances, 2010, RBI. Note: Data for 2008–09 and 2009–10 are revised estimates and budget estimates, respectively. Source: Compiled by authors from basic data provided in the Handbook of Statistics on State Government Finances, 2010, RBI. Another major finding as regards expenditure on this sector is the wide divergence across States. For instance, in 1990–91, expenditure ranged from 13 to 27 per cent, and the annual average for the period 1991–92 to 1999–2000 was in the range of 7 to 26 per cent; for the subsequent decade, the relevant shares fell to a range of 7 to 22 per cent (annual average for 2000–01 to 2009–10) (Table 4). Such wide divergences clearly indicate a high degree of horizontal imbalance in expenditure behaviour across States. In 1990–91, the States that accorded high priority to RE included Maharashtra (27.1 per cent), Uttar Pradesh (25.9 per cent), Madhya Pradesh (25.6 per cent), and Orissa (25.0 per cent). The worst performer in this respect that year was Sikkim (12.9 per cent). During the decade 1991–92 to 1999–2000, in terms of annual average spending, States that accorded high priority to RE were Maharashtra (26.01 per cent), followed by Karnataka (23.3 per cent) and Gujarat (22.9 per cent), and Sikkim (6.8 per cent) continued to be at the bottom. For the period 2000–01 to 2009–10, the annual average allocations for this sector put Andhra Pradesh (21.9 per cent) at the top, followed by Maharashtra (20.3 per cent) and Chhattisgarh (20.1 per cent), and Goa (7.6 per cent) was at the bottom (Table 4). It is worth noting that during the period under review, industrially advanced States like Maharashtra and Gujarat consistently accorded high priority to RE in their budgets, as compared to the BIMARU (Bihar, Madhya Pradesh, Rajasthan, and Uttar Pradesh) States, or even agriculturally advanced States like Punjab and Haryana. West Bengal, Kerala, Punjab, and Tamil Nadu emerge in a poor light in this respect, as their ratios declined by 80.2 per cent, 71.2 per cent, 58.2 per cent, and 53.7 per cent, respectively (Table 5). As regards expenditure on various components within RE, taking all States together, irrigation and flood control, rural development, and agriculture and allied activities (in that order) accounted for most of it, while the shares of agricultural research and education, and cooperation were negligible. Across States, however, there was substantial divergence with respect to prioritisation, as may be seen from Table 6. This is not surprising, given the wide divergences across States in terms of agroclimatic zones and specific needs. Nevertheless, it is worrisome to see how little attention was paid across States to agricultural research and education over the years (Table 6). We conclude this section by making a note of the per capita real expenditure trends in RE. Taking all States together, the figure for 1994–95 was Rs 320, which declined to Rs 318 in 2000–01 and rose to Rs 616 in 2009–10. Not surprisingly, the performance of the BIMARU (Bihar, Madhya Pradesh, Rajasthan, and Uttar Pradesh) States was worse than others, both in terms of absolute levels as well as changes over time. Further, from 1994–95 to 2000–01, 7 out of 25 States were spending less than the average for all States taken together, while in 2009–10, the number of such States increased to 10. The annual average growth rate of per capita real spending in this sector, taking all States together, was 5.8 per cent, and the corresponding proportions for 14 States was less than the combined States’ average; in some cases, the story was one of near-stagnation or even negative change (e.g. Punjab: –0.9 per cent) (Table 7). Notes: To obtain per capita spending for the year 1994–95, population figures for the year 1991 have been used; similarly, for the year 2009–10, population figures (provisional) for the year 2011 have been used for the respective States. States and figures in italics denote performance below the all-States average. It has been argued by many observers that there is a clear imbalance between the powers of the State governments and the Union government to raise revenues (an imbalance heavily biased towards the latter), particularly when considered in relation to their expenditure requirements. The problem has worsened over the years, particularly during the last two decades, creating huge difficulties for the State governments. The neoliberal economic framework has made matters much worse, as State governments have been compelled to compress their expenditure in order to reduce budget deficits. Furthermore, increased centralisation (through the proliferation of centrally-sponsored schemes, often with stringent conditions attached) has limited the policy-making space of State governments in respect of their specific requirements, including appropriate institutional infrastructure, personnel, and so on. The poorer States especially have suffered greatly during this phase in terms of provisioning for development in general, and in particular as regards their expenditure on the “Rural Economy”. In addition, there were often significant cuts in final allocations (as evident in the revised estimates), compared to the amount initially provisioned in the budgets (as budget estimates). Further, as several researchers have pointed out, funds allocated for a particular scheme under budget estimates were not infrequently underutilised (as reflected in the actual expenditure data).21 This was for several reasons, including constraints built into fund-flow mechanisms across different tiers of government. These issues call for the urgent attention of policy makers. The performance of India’s rural economy, in particular agriculture, has been a subject of serious concern in recent years. Our evidence shows that one of the important reasons for the disappointing outcomes in this sector is the inadequacy of public expenditure by successive governments at different levels. In the early years of India’s planned economic development, particularly during the First Five Year Plan, public policy appears to have held out significant promise in respect of meeting the desired levels of expenditure on RE. However, in the following decade and a half there was a slackening of expenditure priorities as far as the rural economy was concerned, until a revival in the mid-1970s and a further consolidation in the 1980s. As a proportion of GDP, the expenditure on RE increased from around 1.9 per cent in the 1970s to 2.8 per cent in 1980s. From the early 1990s, however, with the onset of neoliberal economic reforms, the rural economy has once again suffered relative neglect and the expenditure allocated to it (as a proportion of GDP as well as combined expenditure) has shown a declining trend. It is worth emphasising that although agriculture is a State subject, much of what happens in the rural economy is conditioned by the overall macroeconomic policy regime, in which the Union government clearly has the controlling hand. Indian agriculture is in dire need of a “big push” with respect to public expenditure (which in turn can also attract private expenditure). Given the crisis of declining or stagnant productivity in agriculture, and the increasing demand for foodgrain to feed an ever-growing population (as well as other demands on agricultural output), it is crucial to prioritise allocation of public expenditure towards this sector. Further, to bridge the gap between demand–supply mismatches, there is a need to increase productivity through technological advancement, which largely depends on a greater quantum of public expenditure. The role of the public sector in this regard is critical, particularly in respect of distributional considerations. Since development of the agricultural sector is primarily the responsibility of State governments, additional central assistance to the States should be accompanied by greater flexibility in the use of resources (while ensuring that funds are not diverted to other purposes). In addition, States should prioritise their expenditure in favour of agriculture and rural development. Attention should not be focused only on increasing crop yields, but adequate provision should also be made to develop allied sectors such as animal husbandry, fisheries, and other sectors of production. There is a great need for investing more in agricultural research and education in the country, which in turn will help in developing appropriate and advanced technologies suited to different agroclimatic zones. Apart from primary expenditures, funds should also be allocated for the proper management, continuation, and upgradation of existing infrastructure such as medium and minor irrigation projects. Finally, we may note that efficient and timely utilisation of funds is crucial to enhance the productivity of this sector. Allocating funds through budgets is not adequate for better outputs or outcomes. Proper monitoring of how these allocated funds are put to use is very important to achieve goals and objectives. 1 For a discussion of the trends relating to public expenditure since the early 1990s, see the contributions in Jha (ed.) 2011. 2 Both the inclusion and exclusion of several budgetary allocations within any definition of RE can be a matter of debate; this is for the obvious reason that it is difficult to draw neat boundaries as regards expenditure items that have an impact on outcomes relating to agriculture and rural development. In an earlier paper, we had defined Total Rural Development (TRD) expenditure as consisting of five items: agriculture and allied activities, rural development, special areas programmes, irrigation and flood control, and village and small-scale industries (see Jha 2007, p. 7) – based on a study by Utsa Patnaik (see Patnaik 2003 and 2011). However, in the present paper, we have made an adjustment in our definition and added two items, namely, fertilizer subsidy and cooperation, to the five items mentioned above. 3 Public expenditure on agriculture and allied activities includes expenditure on agriculture/crop husbandry, soil and water conservation, animal husbandry, purchase and distribution of foodgrains, and food storage and warehousing; it excludes food and fertilizer subsidies. 4 Expenditure on rural development includes expenditure on agriculture and rural development (it may be noted that up to the year 1973–74, there was no such disaggregated data available and public expenditure on rural development was a part of agricultural expenditure), area development and community development programmes (up to 1984–85, what are now termed rural development programmes were called community development programmes), and rural self-employment and wage employment programmes. 5 Expenditure on fertilizer subsidy includes expenditure on distribution of fertilizers, subsidy on imported (urea) and indigenous (urea) fertilizers, sale of decontrolled fertilizers with concessions to farmers, and subsidy given to fertilizer companies. Sometimes, subsidies are opposed by even progressive economists on ecological grounds. But it is elementary common sense that moving farmers away from harmful chemical fertilizers towards organic cultivation itself may necessitate incentives in the form of subsidies. 6 Expenditure on irrigation includes expenditure on irrigation, on multipurpose and electricity schemes (up to 1973–74, because of lack of disaggregated data), and on minor irrigation only (in later years). 7 Public expenditure on cooperation includes expenditure on direction and administration, training, research and evaluation, audit of cooperatives, information and publicity, assistance to multipurpose rural cooperatives, assistance to credit cooperatives, assistance to other cooperatives, agriculture credit stabilisation fund, assistance to public sector and other undertakings, cooperative education, other special areas programmes, etc. 8 Functional classification is a detailed classification of the functions that different governmental entities aim to achieve through various kinds of outlays. This is an important classification of government budgets, along with administrative and economic classification. 9 Items such as agriculture and allied activities, rural development, industries, irrigation and flood control, special areas programmes, etc., are a part of economic services as per budgetary classification. 10 As per the Reserve Bank of India’s classification of developmental expenditure, items under economic services as well as under social services comprise total developmental expenditure. 11 Items covered under general services in budgetary classifications are normally tagged as non-developmental expenditure as defined by the Reserve Bank of India. 12 The office of the CAG is the supreme audit institution of India. 13 Disaggregated, component-wise budgetary expenditure data under RE are not readily available prior to the 1990s and hence our comparative analysis for the States is limited to the period after the early 1990s. 14 However, the public sector plan outlays of the Union government under RE and the priorities accorded by it to various sub-heads across plan periods have been reported by us in this paper. 15 For further details, see Bhalla 2007 and Jha 2007. 16 For further details, see Nachane (ed.) 2011. 17 According to data provided by the National Crime Bureau Records, between 1998 and 2010, more than a quarter of a million farmers have committed suicide, and, on an average, almost 17,000 farmers commit suicide every year. 18 Rural development expenditure, as defined by Utsa Patnaik, is the sum-total of the plan outlays of the Centre and States under five heads: agriculture, rural development, irrigation and flood control, special areas programme, and village and small-scale industry. 19 In absolute terms and at current prices, a ten-fold increase was seen in plan expenditure on agriculture and allied activities in the period between the Seventh FYP (1985–90) and Eleventh FYP (2007–12). 20 The increased share was largely because of various kinds of rural development programmes, including community development programmes, initiated during the late 1970s, and the implementation of the recent Rural Employment Guarantee Scheme. 21 For a discussion of trends relating to public expenditure since the early 1990s, see the contributions in Jha (ed.) 2011. Amin, Samir (2004), “The Geopolitics of Contemporary Imperialism,” paper presented in an international conference on “The Economics of the New Imperialism”, New Delhi; available at http://www.networkideas.org/feathm/feb2004/Samir_Amin_Paper2.pdf, viewed on 8 May 2011. Bates, R. (1997), “Institutions as Investments,” Journal of African Economies, vol. 6, no. 3, pp. 272–287. Bhalla, G. S. (2007), Indian Agriculture since Independence, National Book Trust, New Delhi. Bhalla, G. S., and Singh, G. (2001), Indian Agriculture: Four Decades of Development, Sage Publications, New Delhi. Chadha, G. K. (2003), “Indian Agriculture in the New Millennium: Human Response to Technology Challenges,” Indian Journal of Agricultural Economics, vol. 58, no. 1, January–March, pp. 1–31. Chand, Ramesh (2010), “SAARC Agricultural Vision 2020,” Agricultural Economics Research Review, vol. 23, pp. 197–208. Deshpande, R. S., and Arora, Saroj (2010) (eds. ), “Agrarian Crisis and Farmer Suicide,” Land Reforms in India, vol. 12, Sage Publications, New Delhi. Dev, S. Mahendra (1997), “Subsidies and Investments in Indian Agriculture, Issues and Perspective,” Rajiv Gandhi Institute for Contemporary Studies (RGICS) Paper No. 39 (PDF version), New Delhi, 2010. Dev, S. Mahendra, and Sharma, Alakh N. (2010), “Food Security in India: Performance, Challenges and Policies,” Oxfam India Working Papers Series (OIWPS) VII, New Delhi. Fan, Shenggen, Brzeska, Joanna, and Shields, Ghada (2007), “Investment Priorities for Economic Growth and Poverty Reduction,” 2020 Focus Brief on the World’s Poor and Hungry People, International Food Policy Research Institute (IFPRI), Washington, D.C.; available at http://conferences.ifpri.org/2020 Chinaconference/pdf/beijingbrief_fan.pdf, viewed on April 20, 2011. Fan, Shenggen, Hazell, P., and Haque, F. (2000), “Public Investments by Agro-economical Zones to Achieve Growth and Poverty Alleviation Goals in Rural India,” Food Policy-25, Washington, D.C. Fan, Shenggen, Hazell, P., and Thorat, S. K. (2000a), “Impact of Public Expenditure on Rural Poverty in India,” Economic and Political Weekly, 30 September, pp. 3581–3588. Fan, Shenggen, Hazell, P., and Thorat, S. K. (2000b), “Government Spending, Agricultural Growth, and Poverty in Rural India,” American Journal of Agricultural Economics, vol. 82, no. 4. Fan, Shenggen, Mogues, Tewodaj, and Beni, Sam (2009), “Setting Priorities for Public Spending for Agricultural and Rural Development in Africa,” International Food Policy Research Institute (IFPRI) Policy Brief-12; available at http://www.ifpri.org/sites/default/files/publications/bp012.pdf, viewed on May 30, 2011. Fan, Shenggen, and Rao, N. (2003), “Public Spending in Developing Countries: Trends, Determination and Impact,” International Food Policy Research Institute (IFPRI) Discussion Paper no. 99, Washington, D.C. Fan, Shenggen, and Rosegrant, Mark W. (2008a), “Investing in Agriculture to Overcome the World Food Crisis and Reduce Poverty and Hunger,” International Food Policy Research Institute (IFPRI) Policy Brief-3, Washington, D.C. Fan, Shenggen, Yu, B., and Saurkar, A. (2008b), “Public Spending in Developing Countries: Trends, Determination and Impact,” in Shenggen Fan (ed. ), Public Expenditures, Growth, and Poverty: Lessons from Developing Countries, Johns Hopkins University Press, Baltimore, Maryland. Ghosh, Jayati (2010), “The Political Economy of Hunger in 21st Century India,” Economic and Political Weekly, vol. 45, no 44, pp. 33–38. Golait, Ramesh, and Lokare, S. M. (2008), “Capital Adequacy in Indian Agriculture: A Riposte,” Reserve Bank of India Occasional Papers, vol. 29, no. 1, Summer. Government of India (GoI) (2005), Situation Assessment of Farmers: Some Aspects of Farming, NSS Report No. 496(59/33/3), National Sample Survey Organisation (NSSO), New Delhi. Government of India (GoI) (2008a), Eleventh Five Year Plan: 2007/2012, Planning Commission and Oxford University Press, New Delhi. Government of India (GoI) (2008b), Report of the Working Group on Agriculture Research and Education for the Eleventh Five-Year Plan (2007–2012), Planning Commission, New Delhi. Government of India (GoI) (2010a), Economic Survey 2009–10, Ministry of Finance and Oxford University Press, New Delhi. Government of India (GoI) (2010b), Employment and Unemployment Survey, 2009–10, Labour Bureau, Ministry of Labour and Employment. Government of India (GoI) (2011a), Economic Survey 2010–11, Ministry of Finance and Oxford University Press, New Delhi. Government of India (GoI) (2011b), “Issues for Approach to the 12th Five Year Plan,” power point; available at http://planningcommission.nic.in/plans/planrel/12appdrft/pc_present.pdf, viewed on May 7, 2011. Government of India (GoI) (various years), Indian Economic Statistics- Public Finance, New Delhi, India. Government of India (GoI) (various issues), Indian Public Finance Statistics, New Delhi, India. Hayami, Y, and Ruttan, V. (1985), Agricultural Development: An International Perspective, Johns Hopkins University Press, Baltimore, Maryland. Jha, Praveen (2002), Land Reforms in India: Issues of Equity in Rural Madhya Pradesh, Sage Publications, New Delhi. Jha, Praveen (2007), “Some Aspects of the Well-Being of India’s Agricultural Labour in the Context of the Contemporary Agrarian Crisis,” Indian Journal of Labour Economics, New Delhi. Jha, Praveen (2009), “Agriculture and Rural Infrastructure,” Block-II, reading material for M.Phil. programme in Agricultural Economics (mimeo), IGNOU, New Delhi. Jha, Praveen (2011) (ed. ), Towards Progressive Fiscal Policy in India, Sage Publications, New Delhi. Jha, Praveen, Das, Subrat, and Acharya, Nilachala (2011), “Centrally Sponsored Schemes: Are They the Solution or the Problem?,” in Praveen Jha (ed. ), Towards Progressive Fiscal Policy in India, Sage Publications, New Delhi, pp. 374–405. Mathur, Archana S., Das, Surajit, and Sircar, Subhalakshmi (2006), “Status of Agriculture in India Trends and Prospects,” Economic and Political Weekly, vol. 41, no. 52, pp. 5327–5336. Nachane, D. M. (ed.) (2011), India Development Report, Oxford University Press, New Delhi. Paroda, R.S., and Kumar, Praduman (2000), “Food Production and Demand in South Asia,” Agricultural Economics Research Review, vol. 13, no. 1, pp. 1–24. Patnaik, Prabhat (2005), “The Crisis in India’s Countryside,” paper presented at the Seminar on “India: Implementing Pluralism and Democracy” (mimeo), Department of Philosophy, University of Chicago, November 11–13. Patnaik, Utsa (2003), “Deflation and Déjà vu: Indian Agriculture in the World Economy,” in V. K. Ramachandran and Madhura Swaminathan (eds. ), Agrarian Studies: Essays on Agrarian Relations in Less Developed Countries, Tulika Books, New Delhi, pp. 111–143. Patnaik, Utsa (2006), “Poverty and Neo-Liberalism in India,” Rao Bahadur Kale Memorial Lecture, Gokhale Institute of Politics and Economics, Pune; available at http://www.networkideas.org/featart/jan2007/neo-liberalism.pdf, viewed on April 25, 2011. Patnaik, Utsa (2007), “Neoliberalism and Rural Poverty in India,” Economic and Political Weekly, vol. 42, no. 30, pp. 3132–3150. Patnaik, Utsa (2011), “Unbalanced Growth, Tertiarization of the Indian Economy and Implications for Mass Living Standards,” in Praveen Jha (ed. ), Towards Progressive Fiscal Policy in India, Sage Publications, New Delhi, pp. 299–325. Pinstrup-Andersen, P., Londono, N., and Hoover, E. (1976), “The Impact of Increasing Food Supply on Human Nutrition: Implications for Commodity Priorities in Agricultural Research and Policy,” American Journal of Agricultural Economics. Ramachandran, V. K., and Swaminathan, Madhura (2003), “Introduction,” in V. K. Ramachandran and Madhura Swaminathan (eds. ), Agrarian Studies: Essays on Agrarian Relations in Less Developed Countries, Tulika Books, New Delhi, pp. xiv–xv. Ramachandran, V. K., and Swaminathan, Madhura (2002), “Rural Banking and Landless Labour Households: Institutional Reform and Rural Credit Markets in India,” Journal of Agrarian Change, vol. 2, no. 4, October, pp. 502–544. Reserve Bank of India (RBI) (2010), Handbook of Statistics on State Government Finances, 2010, Mumbai, India. Reserve Bank of India (RBI) (various years), State Government Finances: A Study of Budgets, Mumbai, India. Sen, Abhijit (2003), “Globalization, Growth and Inequality in South Asia: The Evidence from Rural India,” in Jayati Ghosh and C. P. Chandrasekhar (eds. ), Work and Well-Being in the Age of Finance, Tulika Books, New Delhi. Thirtle, C., Piesse, J., and Lin, L. (2003), “The Impact of Research Led Productivity Growth on Poverty in Africa, Asia and Latin America,” World Development, vol. 31, no. 12, 1959–1975. Vaidyanathan, A. (2006), “Farmers’ Suicides and the Agrarian Crisis,” Economic and Political Weekly, vol. XLI, no. 38, September 23. Vyas, V. S. (2006), “Agrarian Distress: Strategies to Protect Vulnerable Sections,” The Indian Journal of Labour Economics, vol. 48, no. 1, January–March. Vyas, V. S. (2008), India’s Agrarian Structure, Economic Policy and Sustainable Development: Variations on a Theme, Academic Foundation, New Delhi. World Bank (2009), “Implementing Agriculture for Development,” World Bank Group, Agricultural Action Plan, 2010–12, p. xiv; available at http://siteresources.worldbank.org/INTARD/Resources/Agriculture_Action_Plan_web.pdf, viewed on May 7, 2011.